We’re cooking out tonight — we are on the cusp of the Fourth of July, you know — and we’ve got cheeseburgers on the menu. 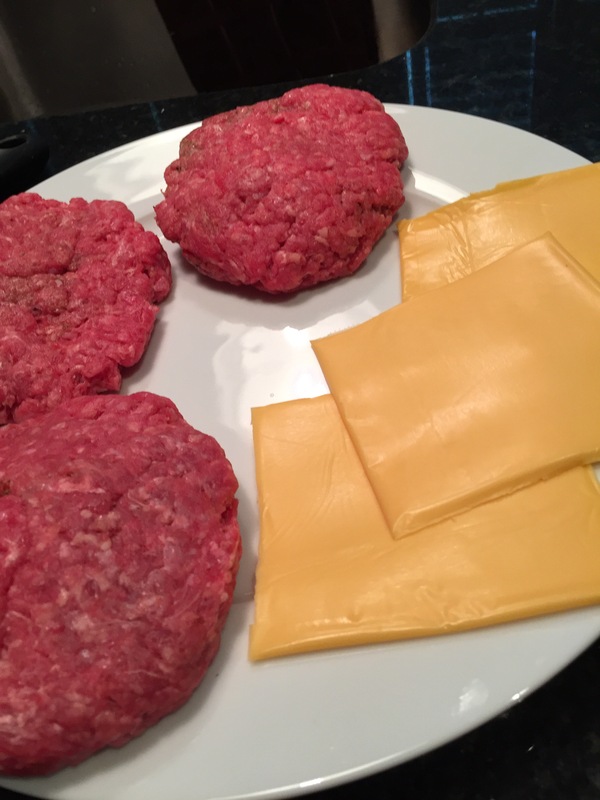 The meat is ground chuck, to ensure a decent amount of fat and sizzle, and the cheese is American cheese. Anything else would be misguided, and arguably unpatriotic, too. What is American cheese, exactly? Beats me, but it’s probably some combination of multiple different kinds of cheese, as befits our melting pot country. And speaking of melting, no cheese does it better than good old American cheese. I’m a cheese lover, and I wouldn’t ever put American cheese on my cheese plate. But on a burger, there’s really nothing better. I’ve been thinking about buying a grill for a while now. I got some much-appreciated suggestions from friends, but it has been a busy summer and I just hadn’t been able to pull the trigger. A few weekends ago, though, Kish and I went to Lowes resolved to buy. Of course, when we got there the grill choices were mildly overwhelming. There were dozens of different devices, each gleaming with its own seductive, burnished metal, “come cook on me” glow. The grills seemed to come in two sizes: huge, and huger. Most of the grills had two side tables, sliding trays, and enough grill space to cook for the 101st Airborne Division. And the gas grills had an impressive array of knobs and dials that would have been comfortable in NASA’s Mission Control. We nosed around, and I entertained visions of standing behind one of the big units, grilling fork and spatula in hand, drinking beer from a bottle still speckled with ice and preparing some impressive grilled item like skewered shrimp. But then I looked deep within and realized that I simply wasn’t going to use the grill that much, or for anything too special. I like to cook steaks, chicken breasts, burgers, and brats — and that’s about it. There are only two of us at home now, and I just don’t need something with a football-field sized grilling area. And our back yard is cozy, without any good place to store a metal device the size of an aircraft carrier. So, after taking a few swings through the big grill display area, we gravitated back to the shelves, where the simple and small charcoal grills were to be found. Ultimately, we settled on an Aussie Walkabout — a simple, square, light grill that cost all of $49.99, will be easily tucked into a small spot on our patio, and can be quickly folded up and stored in the basement when winter comes. It’s not going to produce any wild grilling dreams, but it will work for us. And I liked the name, too. “Walkabout” refers to the walking journey of personal discovery undertaken by Australian aborigines. I felt like I had undertaken my own little foray into grilling self-discovery. As we commemorate the unofficial end of another glorious summer — and in Ohio the weather has been spectacular lately — it’s time for every American to get out and do their duty to their country. That’s right: it’s time to get outside and grill some meat, like our fathers and grandfathers before us. Last night was the grilling. 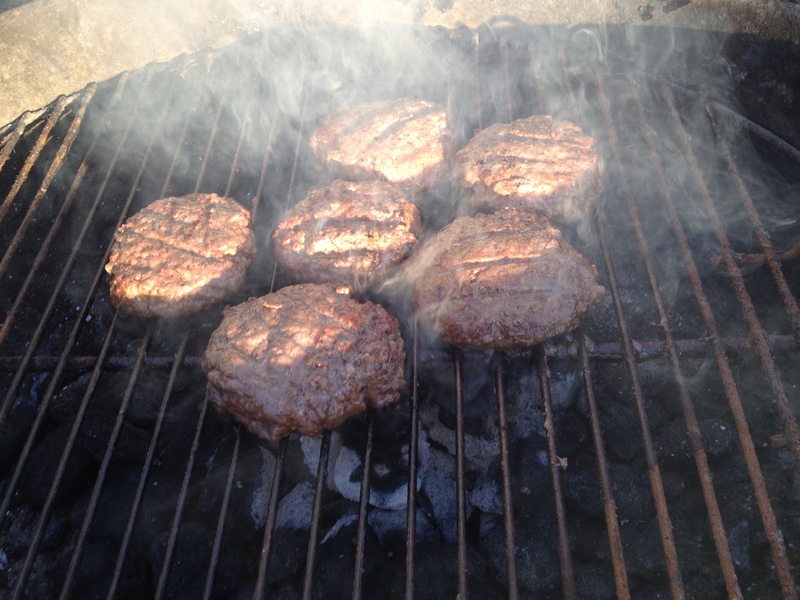 We lit the charcoal and put some burgers on the faithful Weber. They were fantastic: juicy, thick, with just a hint of crust. Served on toasted buns with the required slice of Velveeta cheese, they were absolutely delicious. We had corn on the cob, too, and fresh strawberry shortcake with vanilla ice cream for dessert. We ate on the patio, drinking beer as the sun set and the stars came out and the neighborhood grew quiet. It made me remember why cooking out is so great. Today, we’re chilling. It’s been a busy weekend, and tomorrow it’s back to work. For those of us who associate summer with grilled cheeseburgers eaten on the back patio, brace yourselves: beef prices recently hit a record and are expected to remain at high levels indefinitely. The causes seem to be Mother Nature, the domino effect, and the law of supply and demand. There have been sustained droughts in the cattle-herding states, which makes feed more expensive. More expensive feed has caused ranchers to cut back on the size of their herds. And smaller herds mean fewer cattle available to be converted into those steaks, and burgers, and roasts that Americans relish. With the supply of beef diminished, the price inevitably increases. Don’t expect to find cheap relief for your beef craving at the local restaurant, either. They’ve been hit as hard by the spike in prices as anyone. And don’t be surprised if other meats are more costly — with beef prices hitting the pocketbooks hard, consumers will be looking for alternative meats like chicken and pork to slap on the grill, and the increased demand is causing an increase in those meats, too. There’s nothing quite like a piping hot, melted cheeseburger straight from the grill on a summer’s day. This year, though, we may be making do with hot dogs. It’s Memorial Day, when every red-blooded American male’s thoughts turn to grilling. Last night I broke out the ancient Weber grill, filled it with the remnants of last year’s charcoal, doused it liberally with fluid, lit the ceremonial fire ablaze for the first time of the summer, and engaged in the crucial grill scraping ritual. I then took a healthy swig from the sacred malty adult beverage to commemorate the occasion and raised my face toward the warmth of the sun. Soon the patio air was filled with the heady combination of charcoal smoke and sizzling meat. Last night’s grilling featured cheeseburgers, brats, and some chicken thighs marinated in a mustard-vinegar sauce I prepared using odds and ends from our spice cabinet. 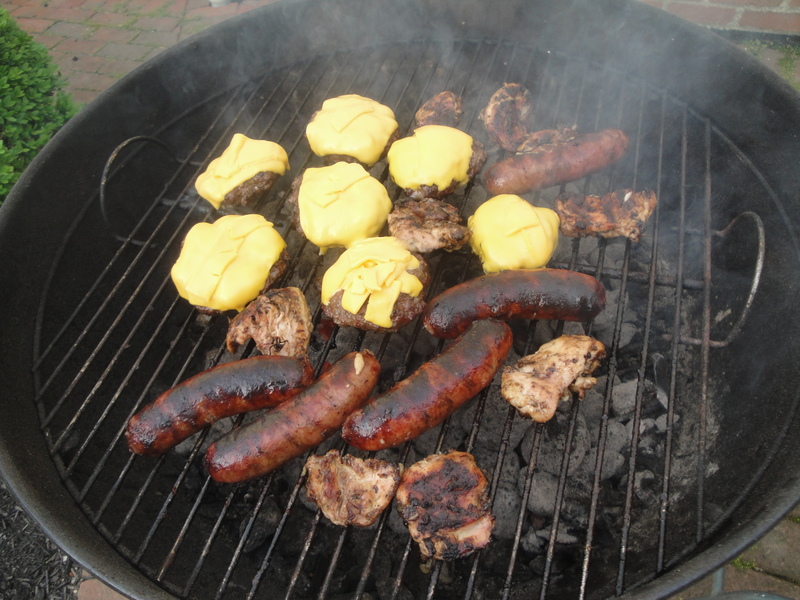 The brats and the chicken were both the products of Ohio farms, in keeping with my interest in local sourcing. With all due modesty, I must confess that the meats were grilled close to perfection, and the chicken marinade was tasty indeed. We also had Ohio sweet corn with butter and a gigantic fruit salad that I had filled with as much Ohio produce as possible. We ate out on the patio as the evening sun filtered through the trees in the backyard. Happy Memorial Day to all! May your grilling adventures today be merry and bright! And, as always, thanks to our veterans and the men and women in uniform whose sacrifices allow us to enjoy this holiday.